The Global Volcanism Program has no activity reports for Andahua-Orcopampa. The Global Volcanism Program has no Weekly Reports available for Andahua-Orcopampa. The Global Volcanism Program has no Bulletin Reports available for Andahua-Orcopampa. The Andahua-Orcopampa volcanic field in the Andahua (or Andagua) valley area, 20 km ENE of Nevados de Coropuna, is a large 60 x 60 km scoria cone and lava field. Known locally as the "Valley of the Volcanoes," the volcanic field lies in a series of deep NNW-SSE-trending, en-echelon valleys: Orcopampa, Andahua, and Ayo. The volcanic field contains extremely youthful dominantly trachyandesitic cinder cones and lava flows that have destroyed buildings and may be only a few hundred years old. The area was reported to have been active during the time of the Incas and to have "become active again" in 1913. Lava flows have repeatedly dammed the Río Andagua valley, and an existing small lake was impounded by the youngest lavas. Galas A, 2011. The extent and volcanic structures of the Quaternary Andahua Group, Andes, southern Peru. Annales Societatis Geologorum Poloniae v. 81, p. 1-19. Parodi-I A, 1975. Volcanes del Peru. Soc Geog Lima Bull, 94: 20-23. Shippee R, 1932. Lost valleys of Peru: results of the Shippee-Johnson Peruvian expedition. Geog Rev, 22: 562-581. There is no Deformation History data available for Andahua-Orcopampa. There is no Emissions History data available for Andahua-Orcopampa. The cinder cones at the center and upper right, surrounded by a prominent field of lava flows, are located in the Andahua valley, known locally as the "Valley of the Volcanoes." The large 60 x 60 km scoria cone and lava field contains extremely youthful lava flows, some of which may be only a few hundred years old. The volcanic field was reported to have been active during the time of the Incas. Lava flows have repeatedly dammed the Río Andagua valley, and an existing small lake was impounded by the youngest lavas. 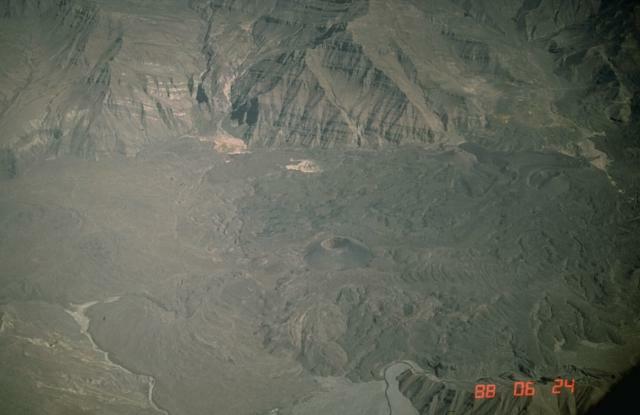 Photo by Norm Banks, 1988 (U.S. Geological Survey). There are no samples for Andahua-Orcopampa in the Smithsonian's NMNH Department of Mineral Sciences Rock and Ore collection. Large Eruptions of Andahua-Orcopampa Information about large Quaternary eruptions (VEI >= 4) is cataloged in the Large Magnitude Explosive Volcanic Eruptions (LaMEVE) database of the Volcano Global Risk Identification and Analysis Project (VOGRIPA).